Electronic receipts are now available. 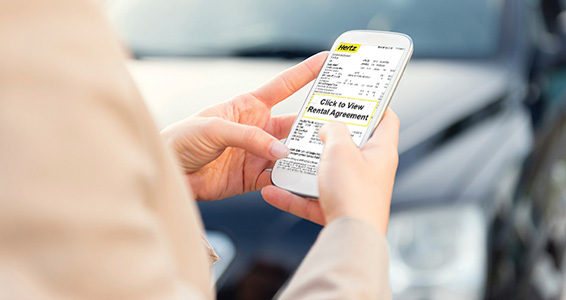 Hertz customers* now have the option to receive rental jackets, rental agreements and return receipts electronically. That means faster pick-up/return times and less paper. Remember to provide a valid email address when making your next reservation. Good for the environment, even better for you. Access your rental information no matter where you are. Rental agreements and return receipts are emailed to you if you choose to receive these documents electronically. Do your part for the environment and update your Gold profile to use eReceipts today. Get on your way faster with Express Return, which allows customers to simply drop off their car and go. Just provide a valid email address at the time of reservation or pick up, return your car to the indicated area and follow the location instructions. We will close your rental agreement and instantly email you your receipt. Leave the rental car keys in the car. Drop rental car keys in the Express Return box. *Please note that if you are returning to a location that is closed, all charges will continue to accrue until the location reopens for business. What was your Hertz experience like? Share with us via Twitter using #Hertzereceipt.